This year brought many new native plant garden projects, and many return customers who wanted more projects where mature natural gardening projects exist already. Natural landscaping can be addicting like that, once a person experiences how easy and beautiful native plant landscaping is, and how many wonderful creatures show up overnight, they usually just want more. The Saratoga Springs, NY region and Saratoga County have been overall delightfully welcoming to the practice of natural landscaping using native plants, more and more people onboard each year. The photo above is taken from a butterfly garden in Burnt Hills in the second year after planting. This homeowner is an avid birdwatcher, and the influx of caterpillars (baby butterflies) in her garden resulted in an influx of fat, happy birds. Veronicastrum virginicum and Boy in Native Landscaping. Photo credit: Stockwell Media. This scene is in a well established garden near the Saratoga Hospital. 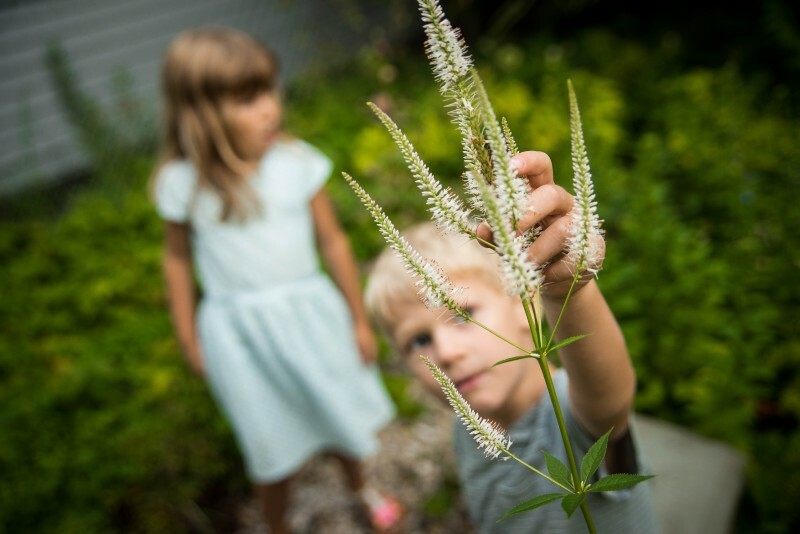 Culver’s Root (Veronicastrum virginicum) is a beautiful native plant with a rich medicinal history. It can take patience to see it established, because Culver’s Root- like many native plants, works hard on establishing its roots during the first year and may go somewhat unnoticed. But the native plant really becomes spectacular by year two or three. A local famous garden with a lot of Culver’s Root can be found at the historic Union Gables Bed & Breakfst, which is walking distance from the renouned Saratoga Spring Horse Racing Track. Roadside Habitat Garden in Saratoga Springs on Maple Ave. In August we had the priviledge of helping a staffing business on Maple Ave in Saratoga convert a private home into a code compliant commercial property. We were commissioned to design and plant a rich habitat restoration strip of beautiful native plants specially selected for salt tolerance and rich biodiversity value. As customers visit the business to open hopeful new chapters in their lives, the neighborhoods butterflies, songbirds, pollinators and hummingbirds will also be passing through, with a brighter outlook on their own Saratoga region lives.